Q - My dishwasher is full of soap suds....help!! Q - Can you use dishwasher pucks in every dishwasher? Q - My dishwasher racks are getting rusty, is there anything I could do about them without having to buy new ones? Q - My dishwasher looks dingy inside...is it time for a new dishwasher? Q - My dishwasher wont drain, what can I check for? Q - My dishwasher is making a noise, is there something I can check before calling for service? Q - The dishwasher is empty when the cycle is over, but the next morning there is water inside the dishwasher, what could be wrong ?? Q - I just installed my food waste disposal, now my dishwasher will not drain, what could be wrong?? Q - My dishwasher racks are getting rusty, is there anything I could do about them without having to buy new ones ? A - If the rack is not overly rusted, a bottle of rack touch up is available and can be purchased at most appliance parts depots. Also new tine ends are also available to cover the rusting tips. 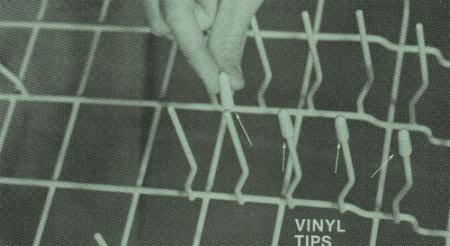 The tine covers just push onto the tine tips...very easy repair!! Q - My dishwasher looks dingy inside...is it time for a new dishwasher ? A - There are some good commercial products to clean water scale and calcium from the inside of your dishwasher...one is Dishwasher Magic. For a dishwasher liner that is just looking "tired"....pouring in some crystal tang ( yes the drink )...run the dishwasher through a short cycle...the tang will freshen up the smell of your dishwasher and also help clean it out. Q - My dishwasher wont drain, what can I check for ? A - Please see the dishwasher pages linked here for more detailed information. Q - My dishwasher is making a noise, is there something I can check before calling for service ? A - Have a look to make sure something has not fallen into the pump assembly, sometimes a hard piece ( like a pit ) or small utensil can fall into the pump and make a grinding style of a noise. A - Two things to consider....clean water or dirty water? Clean water usually indicates the fill valve is not shutting off all the way and the fill valve is "weeping" water in all the time = new fill valve time!! Dirty water usually is not a dishwasher problem but more of a plumbing issue. Often the sink drain that carries the sinks water outside is not fast enough and some of this sink water is backing up into the drain hose and filling up the dishwasher through the drain hose. The drain from the sink to outside needs attention as this type of a problem indicates a slow house drain for that sink. The dishwasher drain line should be clamped to the top underneath part of the counter before entering the sink drain plumbing, this may help the water from coming back inside the dishwasher. A - New disposals have a "plug" in the connection stub for the dishwasher drain hose. This plug MUST be removed or the dishwasher will not be able to drain into the disposal. 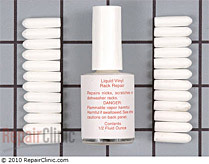 Dishwasher Rack Repair Kit - White - Kit includes vinyl paint and 25 colored vinyl tine caps. 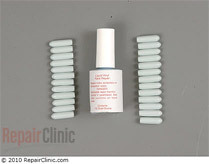 Dishwasher Rack Repair Kit - Light Blue - Kit includes vinyl paint and 25 colored vinyl tine caps.